The Laguna Playhouse Executive and Artistic Directors, Karen Wood and Ann E. Wareham are thrilled to present the Orange County premiere of the Smash-Hit, Off-Broadway musical, MURDER FOR TWO, book and music by Joe Kinosian, book and lyrics by Kellen Blair, choreography by Wendy Seyb, musical direction by David Caldwell and direction by Scott Schwartz. "We are delighted to bring this hilarious and 'Killer' new musical to our subscribers and audiences," comments Wood. "Two Actors, a dozen characters and a classic whodunit, all set to a marvelous new musical score, this is going to be an evening to die for," adds Wareham. MURDER FOR TWO will begin previews tonight, April 22; will open on Saturday, April 25 and runs through Sunday, May 17, 2015 at the Laguna Playhouse, 606 Laguna Canyon Road in Laguna Beach. MURDER FOR TWO has assembled an award-winning design team. The Set Design is by Beowulf Boritt. The Lighting Design is by Jason Lyons. The Costume Design is by Andrea Lauer. The Sound Design is by Jill BC DuBoff. The Production Stage Manager is Katrina Olson. MURDER FOR TWO will begin previews on Wednesday, April 22; will open on Saturday, April 25 and runs through Sunday, May 17, 2015 at the Laguna Playhouse, 606 Laguna Canyon Road in Laguna Beach. Performances will be Wednesdays, Thursdays & Fridays at 7:30pm; Saturdays at 2pm & 7:30pm; Sundays at 1pm & 5:30pm. There will be additional performances on Thursday, March 5; Thursday, March 19 & Thursday, March 26 at 2:00pm. There will be no performance on Saturday, March 7 at 2pm. Tickets range from $41 - $66 and can be purchased online at www.lagunaplayhouse.com or by calling (949) 497-ARTS (2787). Group discounts are available by calling 949-497-2787 ext. 229. The box office is open Mondays - Sundays: 12p.m. to 5 p.m. (open until 7:30pm on performance days). 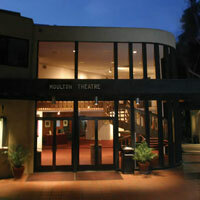 LAGUNA PLAYHOUSE is located at 606 Laguna Canyon Road in Laguna Beach.